Went to the strip last night to try out the Vette with the new Chuck CoW tune. 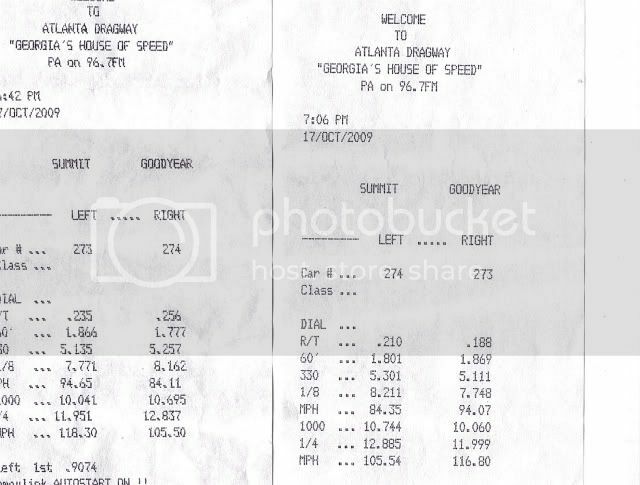 Though the Vette's best time ever was a 12.39 at the zMAX in Charlotte, the times last night are compared to a week before the tune, using the same dragstrip at Commerce (comparing apples to apples). Two weeks ago the best Commerce ET's were consistently running about 12.4 and 12.5 at around 115. The car is so much more powerful now with the tune and new rear 342, I am having to get used to it all over again. PLUS I really need some better tires than the stock RF's. Anyway, it hooked pretty good, my reaction times were decent, and the 60-foot times were 1.8 or so (need to work on that), but when the car shifted into second it broke traction every time. Here are my two best runs (running against my son in his Camaro and he was no slouch either). Though it was close, I earned my 11-second club sticker (#273). Last edited by mongooseC6; 10-18-2009 at 09:06 AM. What other mods do you have? This is really making me want to get a tune. Chuck is the man, nice run. Before the CoW tune/rear end change (A6 Attack package), the only mod was the Vararam CAI. Last night felt awesome - the car felt like a rocket - if I can work on my own skills and handle that much power and slap on some drag tires. I'm looking as we speak. Can you suggest a good sticky tire? Mickey Thompson? Nitto? Mickey thompson et streets. Even cammed guys use these on 17' wheels and they work great. We only have three more Friday night Test and Tunes scheduled at the local strip (that is with weather permitting). It may be next spring before I can find some wheels and MT's. At least there will be something to look forward to next March. I've been looking for some 17-inch wheels that look like my gumby's but still haven't found any. I look forward to sticking with the 2nd gear. Right now it breaks traction and screams a little and gets a little squirrel-y. I finally learned to drive through that 'wiggle' instead of coming out of it. Man, this is fun and is gonna be even "funner." Whoo-whoo! NICE! Didn't I tell you you were gonna LOVE IT!?!?!? My CoW 3.42 A6 ATTACK PACKAGE and A6 ATTACK TUNE CAN'T BE BEAT! Now, I just need a willing local customer to leave their car with me to finalize the Corvettes of Westchester 3.73 A6 ATTACK PACKAGE!!! Call NOW to reserve your AutoCal today! SUPERCHARGER DEALER and INSTALL FACILITY. CLICK HERE: To go to the full magazine story. Chuck, what is the finalization of the A6 Attack package? All that stands between me and finalization is an 18-hour drive. Yes, I love the performance but I do need some sticky tires and a better prepped track. Last edited by mongooseC6; 10-19-2009 at 05:34 PM. The NEW PRO TORQUE A6 CONVERTER! Yes, I love the performance but I do need some sticky tires a better prepped track. The NEW PRO TORQUE A6 CONVERTER! is a real TREAT! I use both MT's and Hooisers. I wouldn't use Nitto's as they have a harder compound and do not hookup that well on higher hp cars. Thanks for the recommendations. I am checking different dealers and sites to try to "hook up" with a good deal.